I finished up my second block in the Moose on the Porch Quilts - Jelly Roll Sampler Quilt Along 2010. I am really enjoying this quilt along since it's showing me all the great blocks that can be completed by using a Jelly Roll. Don't forget to enter my Big Bloggiversary Giveaway to win your own Jelly Rolls!! There probably won't be much crafting this weekend here. We are going to be out and about since it will be such a nice weekend weather wise. 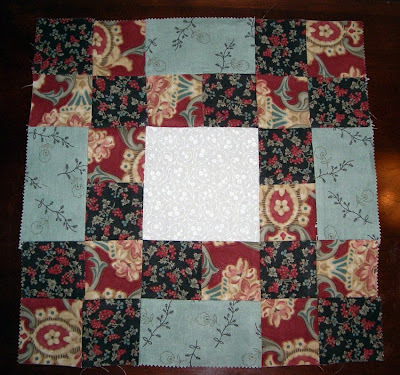 I am using Moda Hemming House Jelly Roll and here is my Second block in the series. Love your colors in this block. They all look so different.